A2600 Frogger (USA) in 01:39.36 by TASeditor. 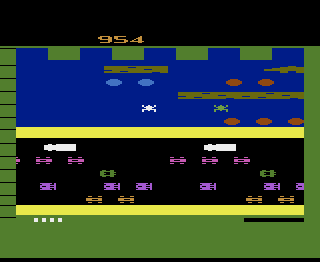 Frogger is the classic game where you must lead five frogs in each level across a road and a river to the safety of their homes while avoiding hazards like cars and trucks, crocodiles, and a venomous snake. The author, TASeditor, plays through the first five levels, after which there is no new content. To see another port of the original arcade game beaten quickly, see the MSX version run. We also have a run of the sequel to the original game.